Instead, my teaspoon poised itself in front of my mouth as my French onion soup went cold while I read the first four chapters without a pause or a breath… I rushed to the part where we find out whether or not Laura’s dog Jack survives being washed downstream in a rising creek after his long journey from Wisconsin to Kansas, running the whole way on foot under the covered wagon. I know how it turns out. I know it so well, I can almost quote the poignant description. But somehow, any time I start reading the opening lines of this book, I can’t stop until I get to that most exquisite writing which releases me from the prison of narrative tension. 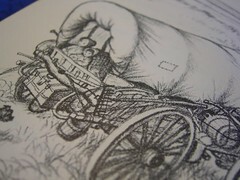 Laura Ingalls Wilder is one writer who gets more done with simple language than just about any other children’s writer. She so thoroughly inhabits the mind life of a little girl, you forget that she’s in her sixties at the time of writing. 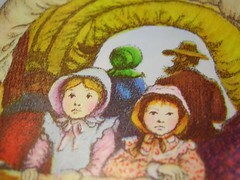 I first heard the Little House series read to me by my mother. She sat in my bed, back against the headboard, reading the books chapter by chapter in her soothing voice. So special did our readings become that for years afterwards, my mother continued to purchase and give to me Laura paraphernalia and any other books related to her life as they were published. I have the full set of hard back books as well as many other Laura related publications all housed in my bookcase. Eight years ago, I finally had the joy of visiting South Dakota where Laura spent her long winter. Our kids were with me and I had just finished reading the series aloud to them… for the second time. We marveled at the tiny house whose drawing room Laura considered large and spacious. We admired the trees planted for each of the girls. All those years later, they towered over us. What an astonishing experience to see that all we had read found its roots in a real place, among real people. In an odd way, I felt as though we were visiting family. That is the power of Laura’s wonderful writing. Laura’s books are a gift to every generation. More than a portrait of a moment in history, of pioneering life, Laura Ingalls Wilder offers us timeless writing. If you haven’t read her books, now’s a great time to start. This entry is filed under General, Literature, Young Writers. You can follow any responses to this entry through the RSS 2.0 feed. Both comments and pings are currently closed. Your post made me sad. It brought back memories of reading this to my children yrs ago. I have been planning my 12 and 15yr boys year. I’m thinking of read alouds like Ivanhoe, etc… to raise our reading level. I wish I could go back to the days of Little House. They seem much more of an enjoyable read, something to cuddle up to. Is that all so bad??? Splendid post! It made me smile. I have always loved Laura.